Sea Lookout! Penthouse 4 chambres avec vue sur le phare! Awesome Resort Living! Le Penthouse est un penthouse de première classe de 3000 pieds carrés au sommet d'un triplex avec une vue parfaite sur l'océan et la plage. Cette maison est pratiquement sur la plage. Les draps, oreillers et taies d'oreillers, serviettes de bain et de cuisine sont fournis. Le Penthouse 4 chambres et 3 salles de bains avec un ascenseur pour vous emmener au sommet de cette magnifique maison directement à partir du parking en dessous. Une fois au sommet, la porte s'ouvre sur une tanière, une cuisine et une salle à manger. Den dispose d'un décor mettant l'accent sur un téléviseur LCD 42 'avec chaînes HD et câble. Canapé pleine taille et siège d'amour. Derrière la tanière est la salle à manger et une table pouvant accueillir 8, avec des sièges supplémentaires pour trois au bar de la cuisine. La cuisine est très spacieuse pour la cuisson des repas avec beaucoup d'espace de comptoir en granit. À l'arrière de la cuisine est le plus grand des suites de maître. Cette chambre dispose d'un lit king-size, d'une télévision à écran LCD et d'une petite terrasse privée pour vous détendre et profiter de la vue en soirée. La salle de bain a deux lavabos, douche debout, et un bain à remous. La deuxième suite principale a un lit king size, accès à la terrasse avant avec des vues plus fantastiques, TV LCD. L'étage est une salle multimédia avec encore un autre téléviseur LCD 42 '. Chambre a une table de jeu de cartes, 2 chaises en peluche et un canapé et un siège d'amour .. Les vues de cette pièce sont incroyables. Vous avez l'océan de l'avant et des vues de Bogue Sound à l'arrière. Cette propriété accepte les animaux de compagnie avec un supplément de 250,00. N'oubliez pas de nous «aimer» sur Facebook pour rester au courant des promotions actuelles et des photos les plus récentes et les plus récentes d'Atlantic Beach! The condo is very spacious and is in great location. You have a view of the ocean. The kitchen was well stocked but needs serving bowls and storage containers. The internet and cable TV was great. We could actually watch the news. And the loft offered some extra space to get away and enjoy Netflix. There are a few upgrades I would recommend. Replace mattresses in the front bedroom and the master bedroom. Some shelving in the refrigerator/freezer is broken or missing. The common area on the parking level has alot of broken stuff and trash that needs to be cleaned up/thrown away. Would expect the owners or HOA to care for that. Upon arrival we found broken toys all over the parking area that were left by previous guests. And the faucets handles were rusted and broken, so to avoid cuts we carried a towel with us when we needed to rinse our feet and chairs. Spacious, Comfortable, Close to Beach. My friends and I had an awesome time at the property. It was true to the pictures and a real comfortable place to stay. We will be coming back to the same property next year! Could be nice. Needs proactive management to ensure property has basic ammenities. Pots and pans were unuasable; they brought new ones the next day. Dog droppings were on the stairs, parking area and on the path to beach. Toaster was filthy and broken; they replaced it the following day. Sleeper sofa was unusable, only had springs. They brought a matterss pad the next day. Several pillows were filthy, sweat stained. Should be constantly monitered monthly; or tell guests to bring their own. Town issued a public water E Coli alert; luckly we were not affected. We absolutely loved our stay at Sea Lookout! The unit was spacious and bright. We loved that we could see the Cape from the deck. It didn't hurt that the weather was perfect for us every day of our vacation. The management company was exceptionally pleasant to work with as well. Arrival & departure was made very easy. Hi Ginny, I'm so happy to hear that you and your family had a great summer vacation. Thank you for the kind words. We strive to provide excellent accommodations and customer service. Thanks again for the feedback and we look forward to seeing you back here at Atlantic Beach soon! Beautiful penthouse with easy access to the beach! My family and I very much enjoyed our time here and will definitely be returning! Beautiful accommodations and very comfortable for a family... great layout and the beds are even comfortable :) Feels like you are oceanfront. Tangie was very easy and delightful to work with. 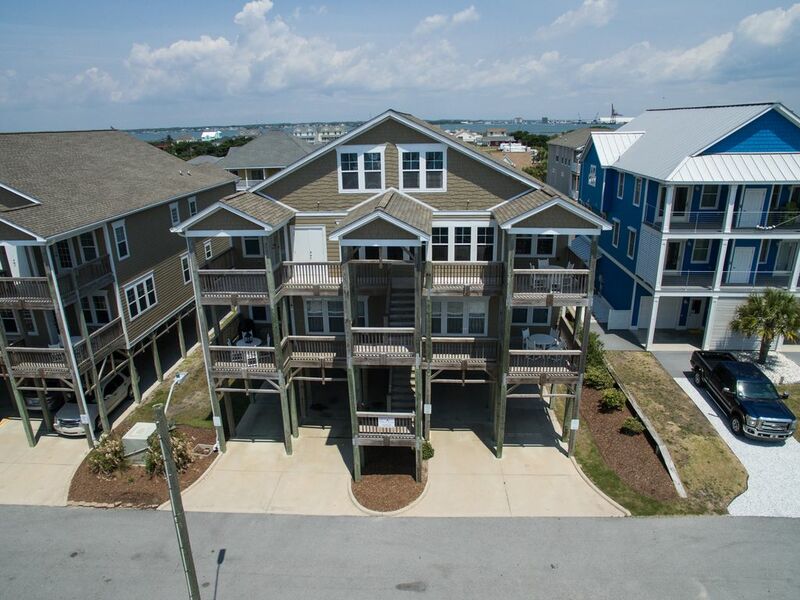 Thank you for sharing your beach home! !